Aluminum Die Casting, Die casting is similar to Permanent mold castings except that the metal is injected into the mold under high pressure of 10-210Mpa (1,450-30,500) psi . This results in a more uniform part, generally good surface finish and good dimensional accuracy, as good as 0.2 % of casting dimension. For many parts, post-machining can be totally eliminated, or very light machining may be required to bring dimensions to size. 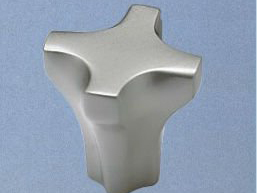 die casting,aluminum casting can be done using a cold chamber or hot chamber process. 1.In a cold chamber process, the molten metal is ladled into the cold chamber for each shot. There is less time exposure of the melt to the plunger walls or the plunger. This is particularly useful for metals such as Aluminum, and Copper (and its alloys) that alloy easily with Iron at the higher temperatures. Common Alloys in Die Casting Aluminum, Zinc and Copper alloys are the materials predominantly used in die-casting. On the other hand, pure Aluminum is rarely cast due to high shrinkage, and susceptibility to hot cracking. It is alloyed with Silicon, which increases melt fluidity, reduces machinability. Copper is another alloying element, which increases hardness, reduces ductility, and reduces corrosion resistance. Aluminum is cast at a temperature of 650 ¡ãC (1200 ¡ãF). It is alloyed with Silicon 9% and Copper about 3.5% to form the Aluminum Association 380 alloy (UNS A03800). Silicon increases the melt fluidity, reduces machinability, Copper increases hardness and reduces the ductility. By greatly reducing the amount of Copper (less than 0.6%) the chemical resistance is improved; thus, AA 360 (UNS A03600) is formulated for use in marine environments. A high silicon alloy is used in automotive engines for cylinder castings, AA 390 (UNS A03900) with 17% Silicon for high wear resistance.